Every maker has a story. Be a part of Lin's Architecture, Art & Craft Studio's story by placing an order, leaving a review, and seeing your review appear here. 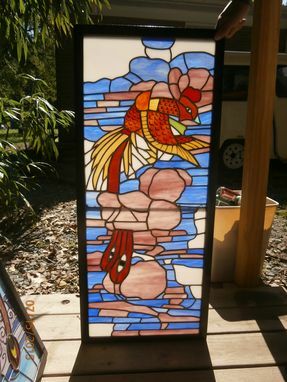 These four stained glass panels are from a set of Traditional Chinese Dragon and Phoenix Paintings. 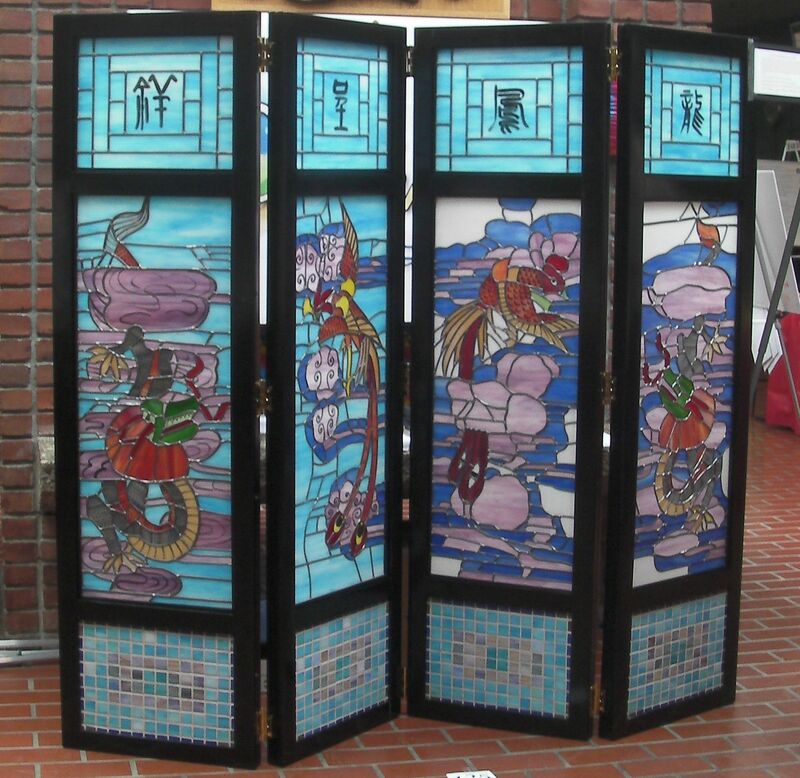 They are the main focus of this 4-Panel Folding Room Screen with 4-small stained glass panels on the top and 4-small stained glass mosaic tiles on the bottom of each panel. The Chinese Calligraphy on the top panels indicates the meanings of this set of Chinese Paintings – Joyful Dragon and Phoenix. This was my Capstone Project of Building Preservation and Restoration (BPR) Program at Belmont Technical College (BTC) (2009-2010 Winter Quarter). 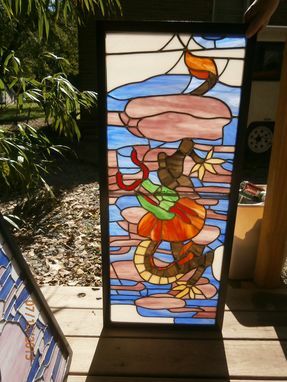 The first panel on the left was done for Stained Glass Class Project of BPR (2009 Summer Quarter). 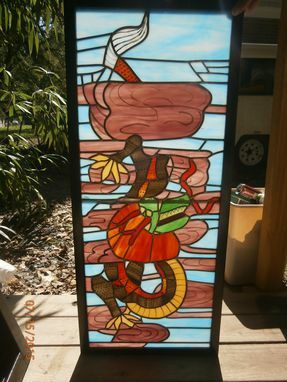 The second panel on the left was done for Advanced Material Science in Stained Glass Project (2009 Fall Quarter). Instructor: Dave Mertz, Professor and Chair of BPR. This project won the 1st Place honors in the Celebration of Learning at BTC 2010. 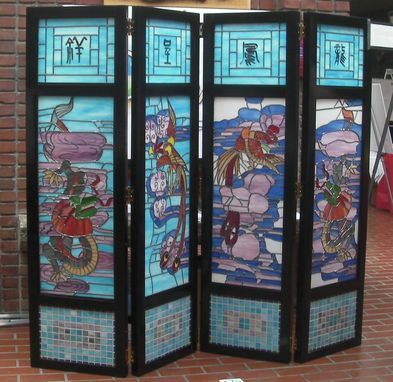 This four panels screen can be dissembled for transportation purpose. 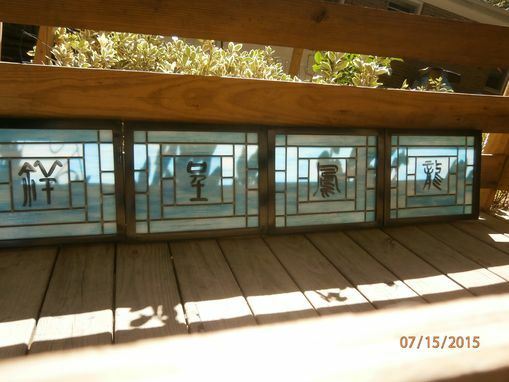 There are four middle stained glasses panels, four upper and lower portion of panels - all can be individual panels. The wood frame are put together with screw. 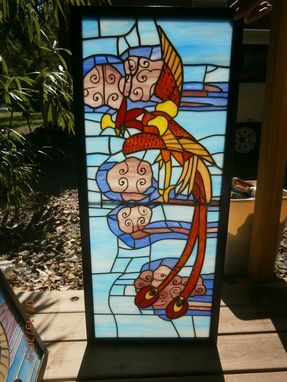 Each individual panel has their own frame, so that the whole screen are double framed. Wood is maple. There is no second one of it - only one which I did for my school project. If you buy it by July 30, 2015, it will be $5000 and I will delivery to your door and put together for you.